Two years after buying Dexter, an experienced Novice eventer, I came to the realization that he wasn’t the horse that was going to get me to my competitive goals. We spent two wonderful years at Novice, and he was always well-behaved and took good care of me. It was very hard to reconcile that what made him so wonderful was also what made him unsuitable for tearing up the turf with blazing speed over imposing obstacles of ever-increasing size. I expected it to take quite a long time to sell him, as my previous horse took seven months. But after putting him up for sale in mid-September, his wonderful new family took him home at the end of January. They live close by and are treating him with the best of care. Since I had a “horse vacation” in Aiken, S.C., scheduled for mid-March with my trainer and fellow barn-mates, it became time to find another horse, and quick! 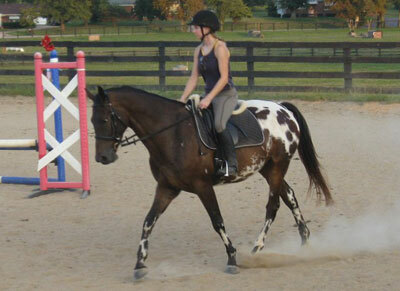 A green off-the-track Thoroughbred (OTTB) was really the only option. 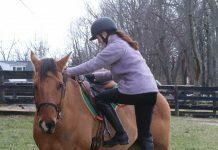 My last three horses have been OTTBs, and the one before that–my first horse–was an Appendix Quarter Horse that was actually 15/16ths Thoroughbred. With my trainer, Megan, about to head out of town for a month, we had exactly one day to horse shop! Isn’t that how life always works? Luckily she has lots of contacts with race trainers throughout Ohio, so a few phone calls were made and suitable candidates were lined up for our all-day journey. 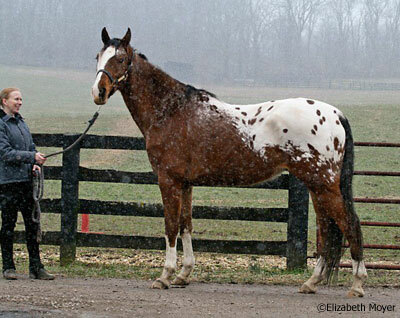 We made numerous stops from Cincinnati to Columbus and were narrowing down a final selection, when she received a message from the breeder of her 6-year-old Appaloosa/Thoroughbred, Jerry, that his full brother (about to turn 4) was for sale. Now mind you, Megan never knew until we spent all those hours in the car that day that I loved Appaloosas, but it just happened to come up during the drive. I had even told someone recently that my “dream horse of a lifetime” would be an Appaloosa/Thoroughbred cross–my two favorite breeds. Why do I love Appies so much? During my formative riding years, there were three of them that I used to ride while living in California that just clicked with me better than any other horses had, by several miles. They were good in dressage and athletic jumpers. Since then, I’ve always harbored a very soft spot for them. Since moving from California to Kentucky over 10 years ago, however, there were scarcely any Appies to be found (although Megan has three; five if you count the ponies! ), so I’d gotten into OTTBs. While we were out shopping for track horses that day and word came along that a 50/50 App/TB (his dam was an OTTB) was for sale, I couldn’t help but freeze my current mission and consider the option. Things moved at light speed from there. The next morning he was on a trailer from Virginia to Kentucky for me to try out and vet. Luckily his personality is absolutely wonderful for a young horse, and he was great for his first ride, even though he’d been backed a year ago and not ridden since then. I was fully expecting to get bucked off a horse that green, but he just ambled along as if we’d spent years becoming trusting partners. After a clear pre-purchase exam, he was all mine! I am so excited to see his progress every day, from having zero steering a month ago, to trotting around the arena making pretty darn good circles and figure-eights. 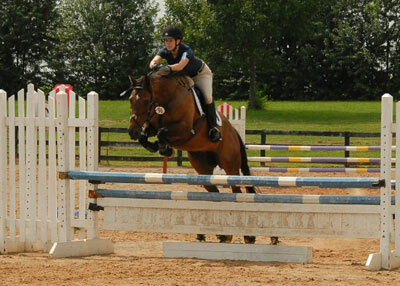 He willingly goes over ground poles, and this summer we’ll see how he takes to cross-rails and cross-country logs. I will try to update more frequently with photos for all of the Appy-lovers out there! I like the looks of the new Appy. Good luck with him. Congrats on your new boy, he’s lovely! 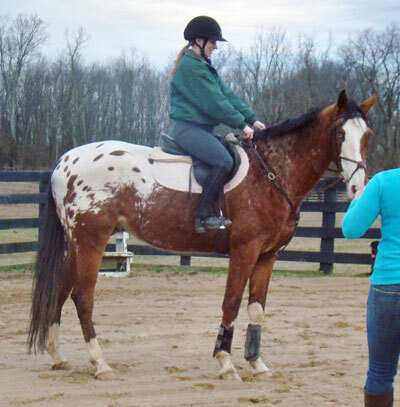 I’m a big fan of appies myself – I’ve had several truly great appies in my life over the years, and i’ve often thought that people don’t look beyond the cute spots and see them for the athletic, hardy and good-natured horses they truly can be.